The summer Jet Ski season is here! Enjoy the coolest site seeing trip of the year! Scenic dolphin tour by Jetski/waverunner! We have the area experience to take you to the best spots in the area where you can enjoy nature’s attractions. Our close proximity to natural feeding areas gives you the best viewing opportunity to see dolphins in their natural freedom. Birds are abundant and seen all along the site seeing tour. Many are seen in this area only by boat or Jet Ski. Often you will see birds perform massive 100′ dives into the water!! Tours cover the Jetty ocean channel and bay areas. While in the back bay area, you’ll travel along the waterway where you also get a close up view of ships in port. 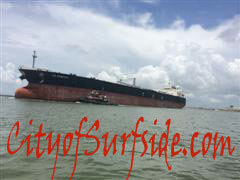 The tour is a great way to explore Surfside from the water. Our sightseeing Tours have become part of many families’ annual trip because of the uniqueness. Booking at least 3 days in advance is recommended but give us a call! We want to be sure you have a chance to get on the water! Sightseeing and Dolphin tour by Jet Ski!!! Sightseeing Tour $140 plus tax for 2 people per ski. Adult driver required. Allow time for Safety orientation, vest fitting, Jet Ski orientation, dolphin viewing etiquette. Guided site seeing tour to areas the dolphins normally feed and migrate. Complete ride, turn in vests. Hourly, half day, full day jet ski, Waverunner, Sea-Doo rentals also available. After Tour Tip: Head to Kitty’s Purple Cow to celebrate! 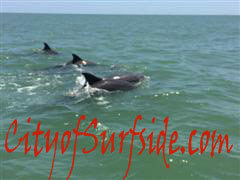 Call 979-709-1665 to book your JET SKI SIGHTSEEING DOLPHIN TOUR reservation.